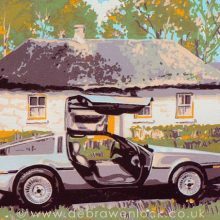 ﻿ Debra Wenlock Art - Custom DeLorean Prints - "Back to Belfast"
Add your own registration number at checkout! 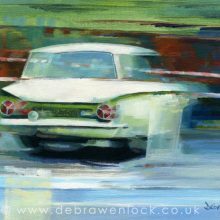 Return to Gallery Themes: Cars & Motorsport, Limited Edition Prints. Explore: Belfast, Belfast Transport, DeLorean. This DeLorean watercolour came about in honour of the first reunion of DeLorean Motor Company former factory employees. Those guys that built these iconic motors in Belfast back in the early 1980s. 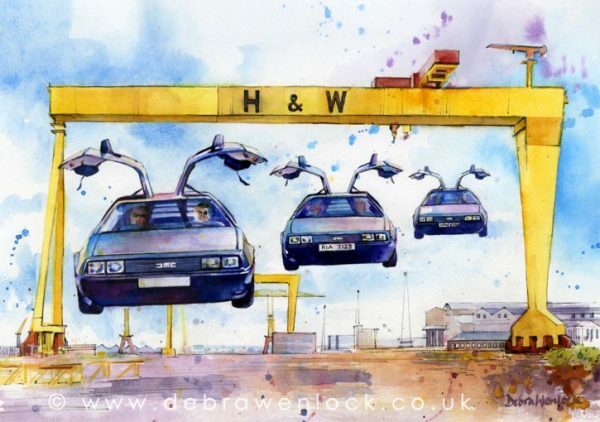 As it is also the year that celebrates the 30th anniversary of the film “Back to the Future” which features a time-travelling DMC car, my imagination summoned up three magical DeLoreans flying “Back to Belfast” via the shipyard – just for fun! 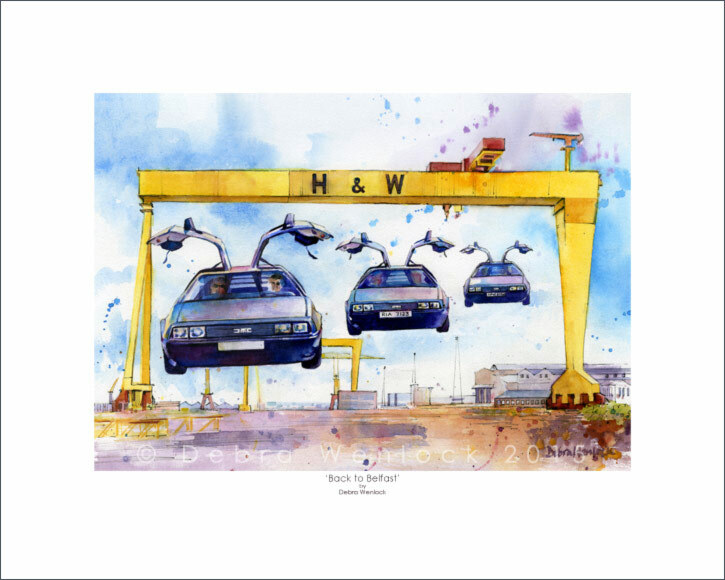 “Back to Belfast” Limited Edition DeLorean Prints are now available, customised with your own registration number for £72.00 each – including UK delivery. For international orders – please contact me for prices for pre-Christmas shipping! I can customise the registration plate of the leading car – so, include your own choice of number with your order! Image size approx 370mm x 260mm (14½ x 10¼ inches) Print Size 500mm x 400mm (19½ x 15¾ inches) with a 65mm (2½ inch) border. 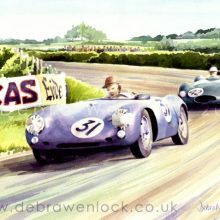 Carefully reproduced from my original painting, each print is individually approved, signed and numbered and hand customised by the original artist. A limited edition of 250 prints only. Professionally printed in Northern Ireland, on best quality 280gsm matte art paper with guaranteed fade resistant pigment inks.